Upon listening to Bhīmasena’s words, Yudhiṣṭhira heaved a sigh, thought for a moment, decided what must be done, and then told him, “Bhīma! What you say is true; but I will say something else; listen to that. Those with a rash and reckless attitude who commit sin, in the end they become targets for pain and sorrow. One achieves success if he undertakes—after careful contemplation and discussion—activities that are courageous and aligned to dharma; even fate will be favourable to such an undertaking. Swelling with strength and motivated by agitation, you want to take up such a task. 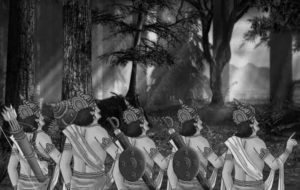 Listen to my opinion; Bhīṣma, Droṇa, and others are great warriors, brave heroes, and experts in weapons and warfare; they will support the Kauravas; the kings whom we defeated have earned Duryodhana’s friendship and are keen to protect him; Duryodhana has given them many rewards and honours, thus keeping them happy; and so, they will be ready to even lay down their lives for him. Bhīṣma, Droṇa, and Kṛpa have the same feelings for both (Pāṇḍavas and Kauravas) but to pay their food-debt they will be ready to fight until their last breath in a war. Karṇa is always impatient and over-enthusiastic; he too knows the science of weapons and wears an impregnable armour; without killing all these people first it is not possible for you go and kill Duryodhana. Thinking about these great archers and the dexterity of Karṇa’s hands, I too am losing sleep, Bhīma!” Upon hearing these words, Bhīma too was overcome by anxiety and fear; then he didn’t speak another word. Some time after this episode, Dharmarāja called Arjuna and took him aside; having made him sit down, with a smiling face Dharmarāja patted his back and spoke words of solace: “Arjuna, look, in archers like Bhīṣma, Droṇa, Kṛpa, Karṇa, and Aśvatthāma, the art of archery has established itself firmly on four legs. They are wholly learned in the use of all the astras including the brahmāstra, divine astras, and demonic astras. Duryodhana treats them as gurus and has kept them satisfied with wealth and honour. He treats warriors as nobility. The entire earth is under his sway. All of us have trusted you alone and placed the entire burden on your back. Now you must do as I say. By rigorous tapas you must impress the devas; wear the clothes befitting a sage, take your bow, quiver, arrows, sword, and other weapons and travel northward. Indra has all the divine weapons. The devas had given it to him to destroy Vṛtrāsura. Therefore, if you approach Indra, you will get all the divine weapons in one place; and he will give it to you!” Arjuna agreed and was about to depart when Kṛṣṇā looked at him and said, “Pārtha! What Kuntīdevī expected of you when she gave birth to you, all that you desire in your heart – may you obtain everything! Cursed is this kṣatriya birth – let it not happen to anyone! How fortunate are the brāhmaṇas, for their profession is not war! Until you return, we shall spend all our waking hours singing praises of your heroism. During this long journey of yours, none of us need any comfort or joy; have a peaceful journey and return safely; may all be well with you!” Within a day of his departure, he reached the Himalayas. From there, walking several days and nights, crossing the Himavat mountain, Gandhamādana mountain, and several forts, he reached Indra’s abode. There, he felt he heard a voice in the sky that said, “Stop!” When he turned and saw around, under a tree he saw a great ascetic, with matted locks, who was shining with divine light. He looked at Arjuna and said, “Who are you? You’ve come here like a kṣatriya, holding knife, armour, bow, and arrow. This is the residence of peaceful brāhmaṇa ascetics; here, weapons have no work. Abandon them!” These words did not shake Arjuna in the least. Upon seeing his courage and determination, the brāhmaṇa was overcome by affection; with a soft smile he said, “What boon do you desire, young man? I’m Indra!” As soon as he heard these words, Arjuna offered his salutations to him with joined palms and said, “O great deity! I have come here to learn the science of weapons from you; the only boon I desire is that!” Indra said with a smile, “After having come here, what will you gain by learning about these weapons Arjuna? Ask for the divine worlds!” Arjuna said, “Devarāja! I desire neither divine worlds, nor divinity, nor the lordship over the divine worlds. Having left my brothers in the forest and not giving a befitting reply to my enemies, if I desire for these things, then in every world at all times I will get a bad name!” Indra was pleased. He said, “Let it be as you desire, my son! I will give you all the weapons. But before that, pay a visit to the Śūla-weilding Śiva. By his grace, you will return an accomplished soul, capable of entering heaven!” Saying so, Indra disappeared.